Remember the tag line from the Mel Brooks movie Spaceballs, “May the Schwartz be with you”? That catchphrase takes on new meaning after listening to this sparkling mainstream album by tenor-saxman Anton Schwartz. 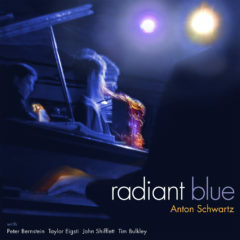 On Radiant Blue, Schwartz explores the blues from various angles with stimulating side trips into New Orleans funk, Brazilian samba, and South African marabi. Like Joshua Redman, Schwartz was an honors student at Harvard, where he preceded Redman in the first-sax chair with the school’s jazz band. A math and philosophy undergrad, Schwartz later abandoned a Stanford Ph.D. in artificial intelligence to become a full-time musician. You’d expect a brainiac like Schwartz to make brainy jazz, and indeed he does. What surprises are the upbeat vibe, stong melodies, and unflagging sense of swing that he brings to this music. Consisting of nine originals and one cover, Radiant Blue in vitalized by contributions from young piano phenom Taylor Eigsti, underrated guitarist Peter Bernstein, and the robust Bay Area rhythm section of bassist John Shifflett and drummer Tim Bulkley. Whether tackling the blues straight on (“Blues for Now”) or sidelong (“Slightly Off Course”), this ensemble shines. Schwartz blows with a warm, fluid tone, and great economy. From his trills on the minor-blues tune “Slightly Off Course” to the simple theme on the South African groover “Life & Times,” his decisions all sound right. He and Bernstein exhibit a special chemistry reflecting a shared musical history that dates to their high school days in New York City. Eigsti also impresses with one tumbling run after another. The music bins are full of bluesy jazz albums. This one brims with optimism and intelligence.